This is a question which has become front and center in recent years as interest in vitamin D has skyrocketed. Why? According to Science News, vitamin D has long been recognized for protecting bones, but in the early 2000s, researchers suggested that vitamin D helped protect against a long list of ailments: multiple sclerosis, asthma, depression, heart disease, and cancer as well as improving athletic performance. From that point on, new interest in this vitamin developed. Here is a quick rundown on Vitamin D, where you can get it, how much to get, and other benefits. The most natural way to get vitamin D is from the sun, but it can be difficult to say how long one should remain in the sun to get the daily amount of vitamin D needed because there are so many variables, including what season it is, the time of day, body parts exposed to the sun, age (skin of elderly does not produce vitamin D efficiently), skin color (those with more melanin in their skin [darker skin] have better protection from the sun, but take longer to make vitamin D), usage of sunscreen, and more. Some people worry that the chemicals in sunscreen are absorbed by the body and may cause cancer, but there is no medical evidence to support that belief. Still, if you are worried, instead of sunscreen, you should use a sunblock which contains zinc oxide or titanium dioxide. It sits on the surface of the skin and is not absorbed. Other natural sources of vitamin D are salmon, herring, sardines, shrimp, tuna, cod liver oil, cheese, egg yolks, mushrooms, and beef liver. Many foods such as milk and cereals are fortified with vitamin D and will be labeled as such. How Much Vitamin D Is Needed Daily? There is controversy about how much vitamin D is needed daily—even among experts. The National Academy of Medicine advises a daily intake of 600 to 800 international units (IU) per day. But there are studies which recommend a daily intake of 1,000 to 4,000 IU to ensure optimal blood levels in most people. 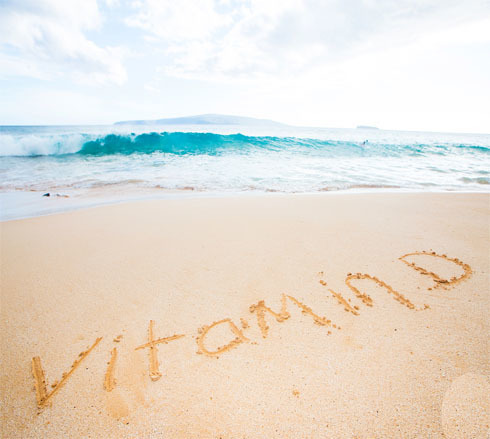 The Institute of Medicine (IOM) has set 4,000 IU of vitamin D as the maximum amount that is safe to consume daily. (You can’t get too much vitamin D from the sun because your skin acts as a regulatory system only allowing the production of the amount of vitamin D that you need.) Obviously, the jury is still out on the amount of this vitamin most people need. What Form of Vitamin D Is Most Effective? Of the two forms of vitamin D you can get in food, D2 (ergocalciferol) comes mainly from plant sources such as mushrooms while D3 (cholecalciferol) comes from animal sources such as salmon, and cod. Vitamin D3 is twice as effective as D2 in raising blood levels of vitamin D. When buying vitamin D supplements, D3 is also the best choice. How Can I Know If I am Getting Enough Vitamin D? Your vitamin D levels can be tested with a blood test by your health provider. A small sample of your blood is drawn from your arm and collected in vial. Lab results will show if you are deficient in vitamin D or if your levels are normal. Your vitamin D level should be between 50 and 70 when tested if you are getting adequate amounts of this important vitamin. What are some of the benefits of vitamin D? Recent studies, however, have shown that vitamin D does not live up to the claims that it reduces or prevents cancer and heart disease as well as some other claims. Enthusiasm for vitamin D in scientific circles is fading, but one thing that we can be sure of is that our bodies need vitamin D.
In earlier times, some children developed a disease called rickets which caused their arms and legs to become misshapen and bent, until a German doctor found that the disease could be treated by exposure to ultraviolet lamps. The cure came from the vitamin D that their bodies made in the presence of the UV light. So, it seems wise to accept our need for vitamin D for the protections we know it gives and consider any other benefits that may be proven in the future to be a bonus.